On July 15, 1938, Italy’s Manifesto of Racial Scientists (Manifesto Degli Scien­ziati Raz­zisti) laid out a scien­ti­fic ex­pla­na­tion for the poli­tics of racism. The anony­mous authors declared that Ital­ians belonged to the Nordic race and were com­pletely “Aryan,” while Jews, being “Semitic,” “do not belong to the Ital­ian race” and “repre­sent the only popu­la­tion which has never assim­i­lated in Italy.” The mani­fes­to, reported by the Ital­ian news­paper Il Popolo d’Italia to have been written in the Minis­try of Popular Cul­ture on in­struc­tions of Ital­ian leader Benito Mus­so­lini, was the pre­lude to Ital­ian racist laws, or Laws for the Defense of the Race, pub­lished on this date in 1938. Owing some­thing to the Ger­man anti-Semi­tic Nurem­berg Laws of 1933–1935, as well as to Adolf Hitler’s never losing an oppor­tu­nity to pres­sure Mus­so­lini on the sub­ject of race, the Laws for the Defense of the Race reversed more than a cen­tury of social and eco­no­mic inte­gra­tion by Italy’s tiny and highly assimi­lated Jewish minor­ity. Among others things, the new laws decreed that mar­riages between Aryans and non-Aryans were hence­forth illegal; banned Jews from em­ploying domes­tic ser­vants “of the Aryan race,” banned Jews from per­forming mili­tary ser­vice in peace or war­time; and barred Jews from owning or man­aging any busi­ness with more than one hun­dred em­ployees or which received defense con­tracts. Addi­tional regu­la­tions sought the com­plete segre­ga­tion of Jews from society and the pro­fes­sions; e.g., Jews could no longer work for banks or insur­ance com­panies. An in­censed Pope Pius XI sent a letter to Musso­lini pro­testing the new laws, which had been cham­pioned not by the “scien­tific com­munity” (that was Musso­lini’s cover) but almost solely by tacti­cal con­sid­er­a­tions on the part of the ardent pro-Ger­man wing of the National Fas­cist Party (PNF) and by Musso­lini him­self, who stressed the impos­si­bil­ity of close national allies (Italy and Ger­many) having a diver­sity of atti­tude. The effect of Ital­ian race laws was the “Aryani­za­tion” of busi­nesses, jobs, and edu­ca­tion; large-scale Jewish emi­gra­tion; forced labor and ghetto­i­za­tion; and the active col­labo­ra­tion of Ital­ians in killing over 6,000 Ital­ian Jews (or about 15 per­cent of Jewish Italians) and terrorizing countless more during the Holocaust. Left: Mussolini and Hitler review Nazi Party troops parading before one of two “Honor Temples” (Ehren­tempel) on Koenigs­platz, Munich, Septem­ber 25, 1937. Early in May 1938 Hitler paid a visit to the Ital­ian capi­tal. The most tragic effect of the Ger­man leader’s visit was the start of the Ital­ian racist and anti-Semitic cam­paign. Because he could not abide his closest ally not embracing his racist ideo­logy, Hitler sent a Nazi dele­ga­tion of race “experts” to visit the extremist wing of the Fascist Party just one month after his visit. 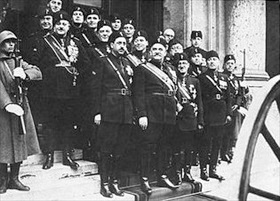 Right: Supervising the Italian anti-Semite cam­paign was the anti-clerical, xeno­phobic Fas­cist poli­ti­cian, lawyer, and journalist Roberto Fari­nacci (1892–1945), seen here on Janu­ary 1, 1935, in the front row (extreme right) during a New Year’s func­tion of party faith­ful. A mem­ber of the Grand Council of Fascism (1935–1943), Fari­nacci was a signa­tory to “Il Mani­festo della Razza,” a piece that appeared in the maga­zine Difesa della Razza in its August 5, 1938, issue. 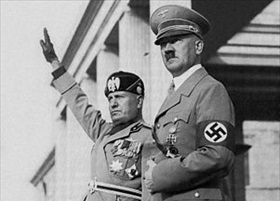 Mussolini selected him to intro­duce the unpop­ular Fas­cist race laws of 1938. Sharing Musso­lini’s fate, Fari­nacci was cap­tured by Ital­ian partisans, sum­marily tried, and exe­cuted in Vimer­cate’s (Northern Italy) municipal square in late April 1945.